Pie Eater is a fascinating and challenging brain teaser game. In 36 engaging levels, you solve logic puzzle with gradually increasing difficulty. You won't be able to stop until you finish all of them. Your mission is to deliver the pie to the dog by moving it to the the dog's position. Moreover, assemble the pie from all its 3 pieces before you feed it to the dog to earn maximum score of the level. Make sure the path to the dog is clear and free from any wood pieces by moving them away according to your needs. 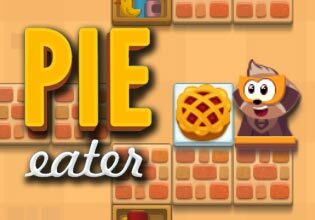 Play Pie Eater now for free and enjoy finishing all its amazing levels!